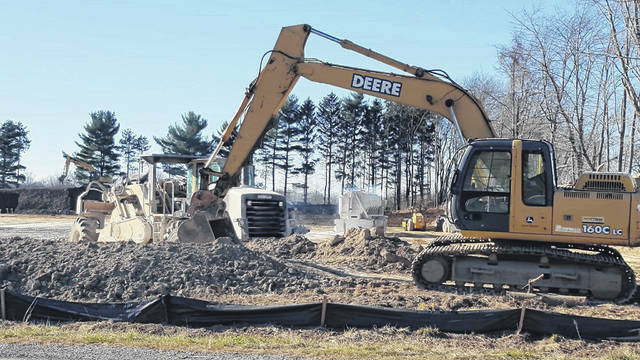 Russ Kent | Galion Inquirer Construction is continuing on a piece of property on Ohio 598 that will become a BellStores property. It will include gas and a DQ. GALION — Preliminary work continues on a parcel of land on Portland Way North between the Keep It Classy Car Wash and the Galion OB/GYN and Mammography Center. It will eventually become a BellStore. If readers are unfamiliar with the BellStore product, there is one across the street from Meijer in Ontario. At Tuesday’s Galion City Council meeting, members did not object to a request for a D-1 liquor permit from BellStore, which is operated by Campbell Oil. When granted, it will be the same permit as the Duchess Shoppe and Marathon and others in the Galion area possess. According to the City of Galion, the developer of the property will offer fuel for regular vehicles and for commercial vehicles, too. A DQ is also going to be part of the development plans. Entry to the property will be off Portland Way South, which is already a headache for drivers between approximately 7-9 a.m. and 4-5:30 p.m. on week days. The city is working with an engineer to come up with solutions for the heavy traffic but nothing is expected to happen until next year. For more information on BellStores, visit their website at www.bellstores.com. https://www.galioninquirer.com/wp-content/uploads/sites/38/2017/11/web1_BellStore-site-in-Galion.jpgRuss Kent | Galion Inquirer Construction is continuing on a piece of property on Ohio 598 that will become a BellStores property. It will include gas and a DQ.